MMG's English blog at PMCurie | St Patrick’s Day: a Powerpoint presentation. St Patrick’s Day: a Powerpoint presentation. 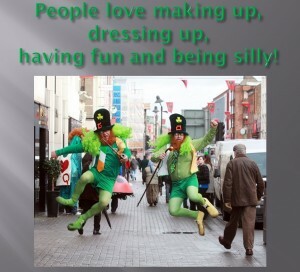 This entry was posted in 4e-3e SEGPA, 6e-5e, 6e-5e SEGPA, MY SLIDESHOWS, younger students and tagged Ireland, powerpoint presentation, St Patrick's Day. Bookmark the permalink. Merci de partager votre powerpoint sur la St patrick! Très bien fait! Je vais l’utiliser demain avec les 6e! All the best! Très beau travail. J’ai présenté votre diaporama à mes 6 qui l’ont adoré et l’ai transmis à mes collègues qui l’ont aussi beaucoup aimé. Merci pour ce partage! FANTASTIC!! thank you so much!! Super job. Thanks for sharing. I was looking for something nice, this is perfect! Thanks for the feedback! 🙂 Glad you liked it. A very interesting work indeed ,thank you so much. You’re welcome, and happy St Patrick’s Day! This is a fun powerpoint. Thanks so much for sharing. My 6èmes are going to love it! Thanks for sharing. It’s nice for teens as you provide lots of information in a light way. I’m from Brazil and my students don’t know much about the topic. That’s just what i need. Thanks a lot!!!! Waow! J’adore! Mes élèves de 5ème segpa vont beaucoup l’aimer aussi!